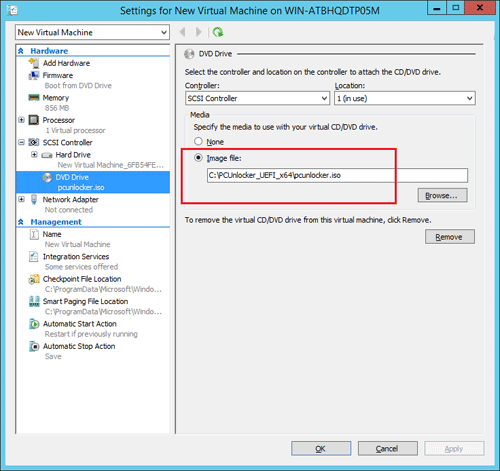 Forgot Windows Server 2012 password for your Hyper-V Generation 2 VM? How to reset Hyper-V password without reinstalling your virtual machine? Starting with Windows Server 2012, Hyper-V provides the options to create a Generation 1 or Generation 2 VM. 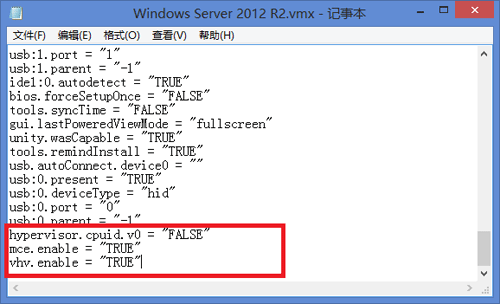 The former is the same VM type that we have today, whereas Generation 2 VM uses UEFI firmware instead of BIOS and it is only supported by Windows 8 / 8.1 and Windows Server 2012 / 2012 R2 as the guest OS. There are many Windows password recovery tools available on the net but most of them don’t support UEFI booting. When booting Generation 2 VM you may get the error “Boot Failed. EFI SCSI Device.” PCUnlocker is the only software that can support UEFI BIOS and works flawlessly with Hyper-V Generation 2 VM. In this tutorial we’ll walk you through the process of using PCUnlocker to reset lost Windows Server 2012 password for Hyper-V Generation 2 virtual machine. 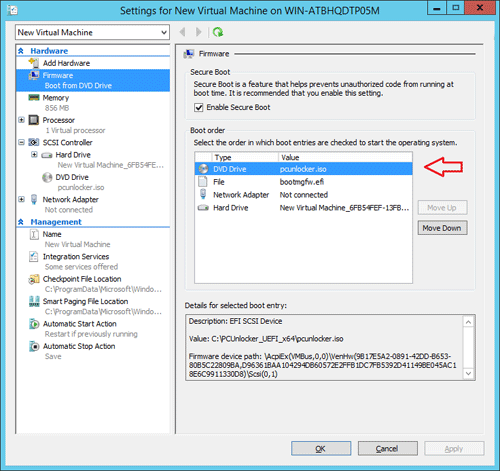 How to Reset Windows Server 2012 Password for Hyper-V Generation 2 Virtual Machine? PCUnlocker can run from a UEFI bootable CD or USB flash drive. However, Hyper-V Gen2 VM doesn’t provide a way to boot from a USB drive, and the virtual DVD drive only supports ISO image file. So here we’ll use the ISO image of PCUnlocker to boot a Gen2 VM and then perform the password resetting. After purchasing the full version of PCUnlocker Enterprise, you’ll receive the download link of PCUnlocker_UEFI_x64.zip, which is about 150 Mb. Unzip the download file and you’ll get an ISO image file called pcunlocker.iso. Launch Hyper-V Manager. Right-click on the Windows Server 2012 virtual machine that you want to reset lost password for, then select Settings… from the drop-down menu. When the Settings dialog box appears, click on the DVD Drive from the Hardware tab. Specify the DVD drive to use the ISO image file of PCUnlocker. Switch to the Firmware option under the Hardware tab. Move DVD Drive to the top of startup boot devices. Click on Apply to save your changes. 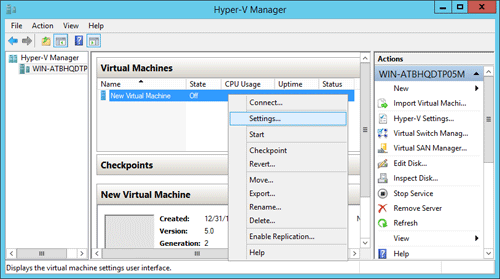 Start the virtual machine in Hyper-V Manager. It will load the WinPE operating system from the bootable ISO image. After a while, you’ll see the PCUnlocker program. Simply select your Windows SAM registry hive, the program will display a list of Windows user accounts. Select a user account and click the Reset Password button. Now you’ve successfully reset Windows Server 2012 password on Hyper-V Gen2 VM. Click the Restart button to reboot the virtual machine. Unmount the ISO file from the virtual machine’s DVD drive and you can then log back into your virtual machine without a password! 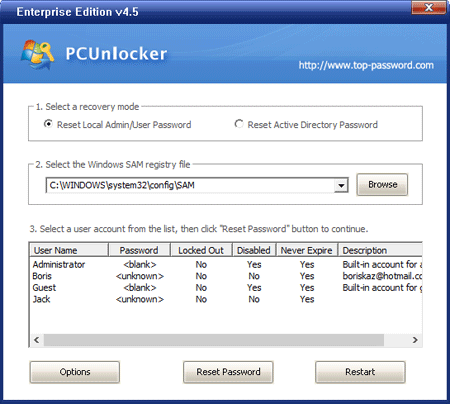 Besides resetting Hyper-V Generation 1 and Generation 2 virtual machine password, PCUnlocker can also be used to reset Windows 8/7/Vista/XP passwords for virtual machines running in VMware Workstation, Parallels, VirtualBox, Microsoft Virtual PC, etc. If you have tried to install the Hyper-V component in a VMware virtual machine running Windows Server 2008 or 2012, you probably encountered the following error: “Hyper-V can not be installed: The hypervisor is already running.” which prevents Hyper-V from being installed. Power down the virtual machine that you want to install Hyper-V on. 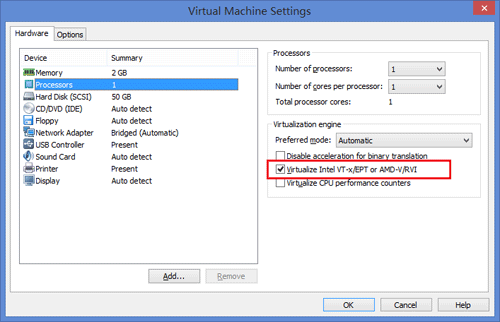 In the Virtual Machine Settings dialog box, tick the box of “Virtualize Intel VT-x/EPT or AMD-v/RVI” to enable the Virtualization engine options. Next you need to find the .vmx configuration file associated with your VMware virtual machine. Now turn on your virtual machine and install Hyper-V again. This will clear up the message saying that you cannot install Hyper-V because a hypervisor is already running. Tips: If forgot the login password of a Windows virtual machine (Gen1 & Gen2) running in Hyper-V, you can reset Hyper-V password easily using PCUnlocker. How to unlock your computer password when you forgot it? The PC is locked and you can not log into Windows. Hence you can not install any software to unlock it. As you already know you can just re-install Windows, but it involves in installing almost any software again from scratch and it may also cause data loss. Luckily, there is a powerful PC unlocker software that will allow you to reset forgotten Windows 8/7/Vista//XP password. It’s called PCUnlocker, which can be downloaded as an ISO file and burned onto a CD or USB drive. After that boot your locked computer from the PCUnlocker Live CD or USB drive, this tool has a very understandable user interface which allows you to unlock Windows password instantly. Step #1: First of all, you have to download the ISO image of PCUnlocker using an alternate computer you can still log on. Once the download is complete, unzip the download file and you’ll get the bootable ISO image: pcunlocker.iso. Burn it to a blank CD (or USB drive) using the freeware ISO2Disc or ImgBurn. Step #2: Now turn on your password protected computer that you’re trying to unlock. Insert the burned PCUnlocker disc and set the boot sequence to CD (or USB drive) first in the computer BIOS. Step #3: Once your computer boots from the CD (or USB drive), it begins to load the Windows PE system. After the booting procedure is complete, you’ll see the PCUnlocker program which displays a list of Windows user accounts existing in your Windows SAM database. Step #4: Choose a user account and then click on “Reset Password” button. Confirm your operation and the program will instantly reset the password and also unlock your user account if it was locked out or disabled. Step #5: The last step is to restart the computer and remove the PCUnlocker Live CD/USB drive. When booting to the Windows logon screen, left the password box empty and you can then log on your computer immediately. Have you ever tried to log into a Windows computer for a few minutes and you finally realize that you forgot the password? Using the PC unlocker software you can unlock any computer password quickly and easily.